In the past Phil had the chance to interview Ken Patterson of Big John Games, as part of SuperPhillip Central doing its part in highlighting indie developers, who we feel are most needed in today's gaming industry. 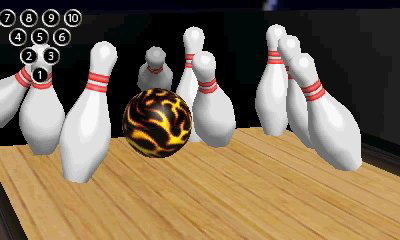 Big John Games has a new title that released a couple of Thursday ago, Smash Bowling 3D for the Nintendo 3DS eShop. Here is Phil's review on that title. I remember as a kid heading down to the local bowling alley, putting on some size 5's and playing in the bumper bowling lanes. Heaven forbid I'd have a lane with gutters. Of course, much like my older self now, I still would prefer playing in the arcade in the back rather than bowl. That said, Big John Games (Kart Krashers, Thorium Wars) has returned with an all-new offering in their series of downloadable software for Nintendo's handhelds. This time they collectively head to the bowling alley with Smash Bowling 3D. Unlike the real thing, I had plenty of fun playing this virtual version of the sport. The main attraction to Smash Bowling 3D is the Career Mode. In this mode, you choose an alley and a ball and bowl for ten frames. There is no competition to speak of-- it's just you versus the alley and those ten white pins. I would have liked to seen AI to face off against, or at least scores to try to beat-- something to give me a sense of progression rather than continuing to bowl frame after frame, hoping I'd unlock something. Instead, all you are doing is trying to unlock trophies as well as new alleys and balls for completing certain in-game objectives. These are things like getting your first career strike, having a final score of over 200 points, and so on. 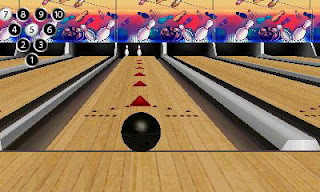 In total, there are approximately twenty unique ball patterns to choose from, many of which can be customized in color only, and over a dozen alleys. Some alleys are more impressive than others, and there's even alleys based off several of Big John Games' past downloadable titles, such as Kart Crashers and Coaster Creator 3D. Unfortunately, the type of ball and alley you select is there only for presentation purposes, it does not affect how you bowl whatsoever. 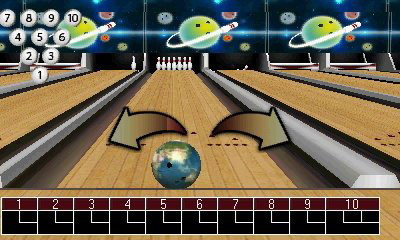 Speaking of how you bowl, Smash Bowling 3D offers two control configurations, touch or buttons. Touch controls offer an interesting take on bowling, allowing you to set four sliders via the touch screen: Position, Power, Aim, and Spin, the latter being the angle of which your ball will move after being thrown. After selecting all four slider settings, you receive an overhead view of the alley and are tasked with tracing the line that adheres to your preconceived slider settings. The touch controls are fun to use, but oftentimes I would receive the notification that I was either too fast or too slow with my tracing. That would be fine if the game showed me the proper speed to trace the line. Smash Bowling 3D does not, however, do that. The more newbie-friendly and accessible control option is the tried and true buttons kind. You position the ball via the directional pad and the other options (Power, Aim and Spin) are determined via meters, pressing the A button with great timing to get the desired settings. While this setup is much easier to use, it still requires some skill to master (and some luck as well, as any bowler will tell you!). The presentation of Smash Bowling 3D fits in well with Big John Games' other offerings. The visuals don't hurt the eyes, but they also don't really have any kind of wow factor either. The 3D effect isn't very pronounced or impressive. As for sound, the music is forgettable, yes, but thankfully it doesn't grate on the ears. There's little in the way of voice work, save for a "Good job" when picking up a spare. Smash Bowling 3D is an adequate bowling game for Nintendo 3DS owners. The biggest shame here is that Big John Games had the potential to do so much more with it. In its state now, Smash Bowling 3D seems more like a tech demo than a full-fledged game. For a while, unlocking new alleys, balls and trophies is a good time, but that fun fades fast like a ten pin lead. Even the multiplayer for up to four friends and family members can only go so far. 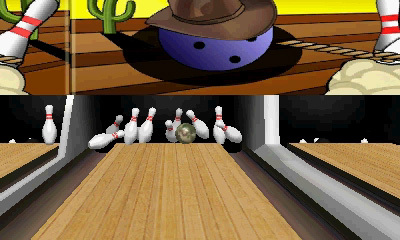 Smash Bowing 3D is nowhere near a gutter ball by any means, but it's also nowhere near a strike either. PS4 and Xbox One? No Thanks. Not Yet. Here's Why.